The Whirlwind foosball table model was replaced in 2010 by the Tornado Sport foosball table. The Whirlwind is a good solid table for that is at the lower end of the Tornado brand tables. If you are looking for all of the right bones to learn the game without the price of some of the high-end tables, the Whirlwind may be a good fit for you. 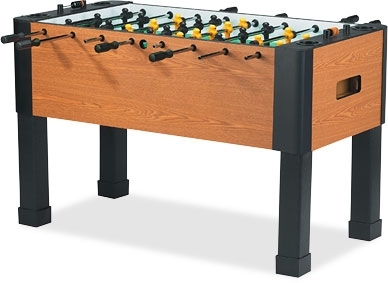 Just be aware that this table lacks some of the foosball table features and quality parts that some of the other Tornado tables offer like counterbalanced men, thicker cabinet construction, adjustable leg levelers to easily level the table, side ball return, and wooden handles. This foosball table is priced at around $650-700 US.